This one-day course will explore carnival dance, it’s traditions and supporting artforms (e.g. music, masquerading and costume). This is an opportunity to explore carnival dance in community practice. The Sounds of ‘Soca’ – understanding culture behind of the sound track to the Caribbean carnival. Participants must have prior experience of dance teaching or performing at any level and in any dance style. Charis Betts graduated from Birmingham City University with a degree in Public Sociology (BA hons), which has given her the platform to take up international work experience combating social issues through carnival arts across the continents. She has been involved within the Leicester Caribbean Carnival from a very young age and has receiving multiple community awards for contributions to the Leicester Caribbean Carnival. At the age of 15 she was entitled Leicester’s youngest troupe owner managing a youth led project, costume workshops and dance sessions and a budget for other young people in Leicester, which has been going for 10 years. She has recently completed a Leadership Programme, delivered by The Curve Theatre after being recognised as one of Leicester’s ‘Cultural Leaders’. Charis is a workshop practitioner and has run workshops across England, Isle of Wight, Europe and Bahamas, and has used Carnival Arts as a tool for breaking the barriers. Charis Betts is an ambassador for carnival arts within the Midlands and strives for artistic excellence within all elements of heritage products. Charis is a Former Carnival Queen and an ambassador for EMCCAN. 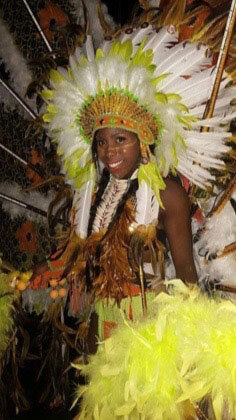 Her mission is to contribute excellence to the UK platform for Carnival Arts in the Midlands. Her goal is to share the art form across many communities as it is a medium for social cohesion and solidarity. She is a freelance costume designer, builder and Soca dance and fitness instructor and trades under the company Spice Queen, she produces beautifully hand crafted costumes ranging from large scale costumes to very small ear cuffs. These costumes can be adorned by people to transform them into Carnival Kings and Queens.